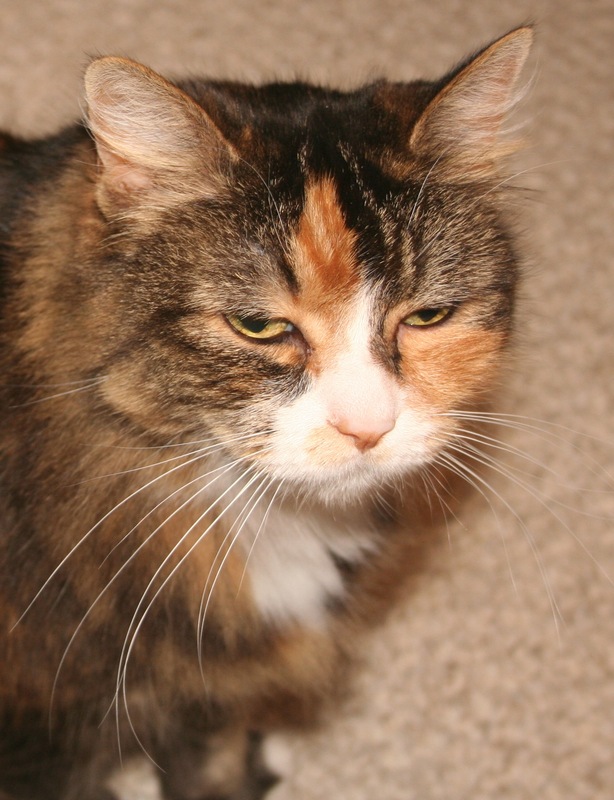 Two weeks ago I received a message from my departed cat, Lucy. I was interviewing Joan Ranquet for Author Magazine Online. Joan is the Hay House author of Communications with All Life: Revelations of an Animal Communicator. Joan also happened to be in Seattle last June, just a few weeks prior to my seventeen-year-old cat’s passing. 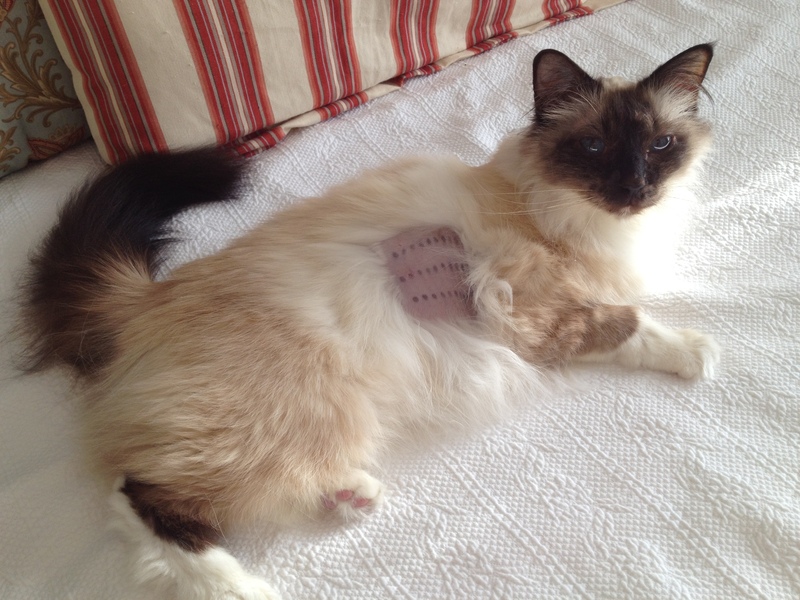 Lucy had been sick for some months with pancreatic cancer. I had been doing my best to make her comfortable and wanted to check in with her while there was still time. Joan stopped by for a session with Lucy and it was satisfying to learn how my care was making Lucy feel better. Lucy died exactly two weeks later. I heard from Lucy in the days following her passing (chronicled in part in “The Passing of an Old Friend“) and, although she hasn’t been physically hanging around the house, I feel Lucy’s presence often. Two weeks ago, when my interview with Joan drew to a close, I couldn’t resist asking her if we could check in with Lucy. All very nice to hear. Lucy thinks I’m on the right path. Very reassuring. But part of me was disappointed at how generic that answer had been. It had been a vanilla message that boiled down to “I love you.” Anyone could have said it. “It’s a book called Oversoul, Inc.,” I started to say, but… History? It had a parallel narrative, one of which took place in the 1950s. Did that qualify as “a bunch of history”? Then it occurred to me. I’d started writing a novel about two boys who run away from their home in Cooperstown, New York, to join the Union Army. It was a book I’d put aside to write the current young adult novel that my agent was presently circulating to editors in New York. I started to tell Joan this, when she stumbled over me and we said almost simultaneously something about the Civil War. It occurred to me later that there was no way Joan could have known about that novel. If she’d just been fishing, why hadn’t she just bitten at Oversoul, Inc. when I first mentioned it? It validated Lucy’s entire message. So, my cat has an opinion on my writing. What a wonderful universe we live in when your cat can offer career advice from the Other Side. I read an account in Kim Sheridan’s book, Animals in the Afterlife, about a woman who went to a medium to connect with a passed loved one. During the session, the woman’s former cat (who had died some time before) had come through with a message. The cat warned the woman that there was something wrong with the tires on her car and when the woman later had it checked out, the information proved correct. But that’s not the cool part. When the woman later listened to the audio recording of her reading with the medium, she heard the perfectly clear sound of a cat meowing, a sound that hadn’t been present when the session took place. I suppose if a cat can alert her former owner about possible catastrophic vehicular malfunction from the Other Side, then my cat Lucy can offer writing advice. Please listen to my full interview with Joan on Author Magazine’s website. Suffice it to say that my cat, Wilson, has had a bad summer. All through May and June he watched with me as our seventeen year old cat, Lucy — the matriarch of the family — grew sicker and sicker, finally succumbing to pancreatic cancer at the beginning of July. It’s been almost six weeks and still, every night, he searches for her. He starts at the top of the stairs to the basement, gazing into the shadowy abyss and calling sadly into the dark. Then he descends, searching, searching, his mews growing more strained as he moves about without success. I told a friend about his behavior a few weeks ago and she suggested I sit down and have a talk with him. As ludicrous as that sounds, the idea wasn’t without merit. Last year I’d read several books written by professional animal communicators for a novel I was writing. I’d even gone as far as taking an animal communication class from one of them, Joan Ranquet, author of Communication with All Life. One of the big takeaways from my research was this: Animals understand far more than might seem possible. Much of their communications is accomplished through a sixth-sense telepathy that starts to make a lot of sense the more you research and experience it. When this is the main method that animals gather information, it opens them up to discovering and understanding a great deal of things. I read one account of a yellow lab who had become distraught upon the death of the ailing grandparent living at the house. The dog was sulky and didn’t eat for weeks, until the family had a ceremony that included the dogs. During the ceremony, the dogs’ guardians piled several items of the deceased grandfather’s clothes in the middle of the room and said prayers for him in what amounted to a memorial service. During the service, the yellow lab sat on the old man’s former clothes. When it was over, the dog took the grandfather’s hat and shredded it to pieces. When he was finished, the dog walked away, seemingly satisfied. Within a day the dog seemed his old self and began eating normally. With this in mind, a few nights later I noticed Wilson gazing longingly toward the basement door. I said, “Where did Lucy go, Wilson? Wouldn’t it be nice if we found her again?” As I said this, a picture came into my mind of Wilson trotting over to Lucy and licking her happily on her head. Wilson can be something of a dog at times. “Honey,” I said, “Lucy died. She’s not coming back.” Something about saying it out loud like that made my stomach spin. Possibilities of reincarnating pets aside, Lucy as we knew her was gone. Wilson seemed to contemplate this. For the next few days he stopped searching the basement or calling out sadly. Maybe our talk had had some effect. But no, a few days after that, the searching resumed and only let up when Wilson had a flair up with allergies that required the vet to shave the side of his body to conduct allergy testing. With the help of medication, Wilson’s feeling better now; but his desperation to find Lucy has grown more urgent. He’s even taken to looking for her in the mornings. He’s a loyal little critter, I’ve give him that. Has anyone had any experience with a grieving pet? Do you have any advice? 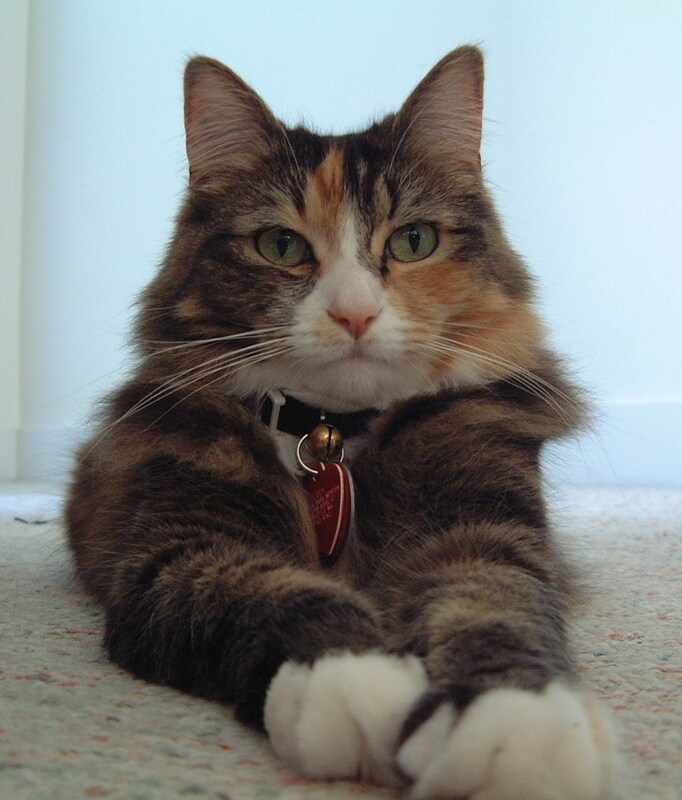 My much beloved cat, Lucy, passed away last week. We adopted her seventeen years ago, right after we moved into our house. We had a special bond, Lucy and I. All I needed to do was sit next to her to coax her into an enthusiastic purr and it was tough — is tough — to see her go. It would be even tougher if she hadn’t paid me a visit a few days after she died. Coincidentally, last fall I’d purchased several iBooks on animal communications and spirituality. On some level I must have known Lucy didn’t have much time left, but I was nonetheless devastated two months ago to learn she had a rare form of pancreatic cancer. I was hoping Lucy would be one of those cats that you hear about that live into their twenties, but that was not meant to be. It turns out that this sort of cancer is untreatable and that cats that have it don’t live very long. Thus the pain meds, steroid shots, and nightly subcutaneous liquid feedings began, all in an effort to make her last weeks more comfortable. The vet gave her two to four months to live. I spent my spare time near the bedroom window where Lucy liked to sit in the sunlight. There I’d read or write or just be in the moment with her. I started reading some of those iBooks on animals and spirituality that I bought all those months ago. I started with a few chapters of Animals in Spirit by Penelope Smith, before moving on to the highly recommended Animals and the Afterlife by Kim Sheridan. Lucy loved all the attention (if not the nightly subcutaneous feedings) and I had a chance to enjoy her presence as her life drew to a close. I even had a chance to do an animal communication session with Joan Ranquet, a Hay House author and the animal communications teacher whose class I’d taken a year ago for a novel I was researching. As June turned to July, I started to get uneasy. I was scheduled to attend a writers conference in New York, one which I had already paid a lot of money to attend. If Lucy was still around, I’d have to leave her, not knowing if I’d ever see her again. The weekend before I was to leave, Lucy grew weaker. I sense the life ebbing from her. She didn’t seem to be in pain, but her limbs grew stiff. Cold. The process began Saturday and continued through the night. By Sunday morning, she could barely move. I spent the morning letting her know I was there, but she lingered, and by Monday morning it became clear that she would need assistance in passing. During a peaceful visit to the animal hospital, she died in my arms. The sense of loss was complete. For seventeen years, Lucy had been a part of that house and now it seemed utterly empty. Her timing had been uncanny. Within twenty-four hours, I was on a flight to New York where I could distance myself from that emptiness and get lost in the bustle of a busy writers conference. The chapter went on to describe the death and dying process from the animal’s point of view and suggested exercises for coping with and letting go of the experience. It was just what I needed to hear, almost as if Lucy was trying to send me a message and help my grieving process from wherever she was. A few nights later, when I was in that state between dreaming and waking, she really did return to give me messages, this time more direct. I’m always with you, she said again and again. I love you. I love you. I love you. But perhaps the most stirring was this: I’ll be back.